Cam Newton was busy making believers of the Washington Redskins on Sunday, but he took the time to let the little children come to him—or rather he to them—for the kingdom of Cam belongs to such as these. After scoring the game’s first touchdown, the Blessed Individual gave the football that crossed the goal line with him to a 10-year-old from Raleigh named Law Widdill who was sitting with his father in the front-row of the end zone. “I was shaking and sweating,” Law said. “There were tears in my eyes. It was really weird. 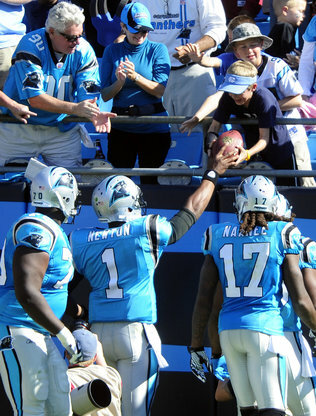 Here was this Heisman Trophy winner, giving me a ball that he scored with.”Law and his 10-year-old cousin Nathan Guptill – who lives in Charlotte and was right behind Law when Newton handed up the ball – have decided to share custody of the football. It’s at Nathan’s house now. Though we know Cam is no stranger to random acts of kiddie kindness, this particular display of charity was apparently inspired by the still small voice of, yes, Mike Shula. The Panthers’ quarterbacks coach had witnessed Newton’s “Clark Kent Becomes Superman” touchdown routine a number of times this season – he does it after every rushing touchdown and now has seven in seven games. Shula had some advice for his star rookie quarterback last week. Once again, Cam Newton is a cocky, selfish jerk who will never be able to run like that in the NFL. Deal with it. UPDATE: While we were writing this, Cam and Ziemba (dressed as a Ghostbuster) were visiting sick kids in the hospital. Related: Hey Cam- how’d you get that S on your chest? LOL. Yup, cocky cocky cocky jerk and a no-talent one at that. Don’t you just LOVE it??!!! I just hate he’ll never make it in the NFL. It’s a shame. Those NFL defense will never let him run on them. Just so im clear on this…he (Cam) didnt say to himself “Im going to give the ball to a little kid” his coach told him to do it in his helmet headset. Im going to take a shot in the dark here but I am going to say that no one had to tell Charles Woodson to give his second interception to a young Packer fan in Minn. on Suday. I’ve never seen a worse use of a #1 draft pick.